Lately, there have been many unique ARFs showing up on the internet. 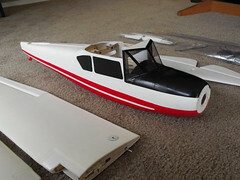 Unfortunately, due to either bad quality or poor customer service and long shipping delays, many of these low cost planes leave a lot to be desired. One company that recently started selling to the US is Pilotage-RC. 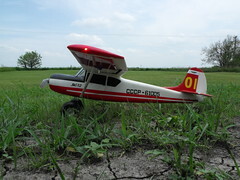 Pilotage has been a leader in the RC industry within Eastern Europe for more than six years. 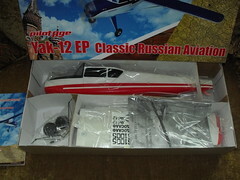 With the opening of their new internet store, pilots around the world can get a chance to see how good Russian engineering can be when it comes to RC. 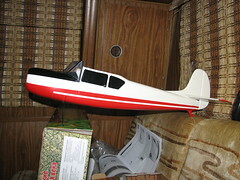 Pilotage has many unique and rarely modeled aircraft marketed under the name Red Square Models. One such plane that really caught my eye was the Yak-12. The prototype first flew in 1947 and has seen many duties. 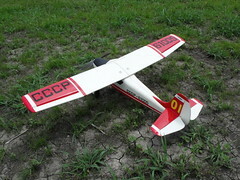 It has been called the “Cessna” of Russia. 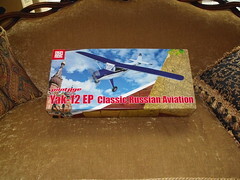 Many young Russian pilots learned to fly in a Yak-12. 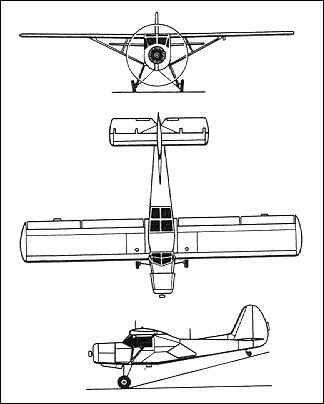 The design has also seen use as a glider tow, air ambulance, agricultural plane, and liaison/artillery spotter plane for the Soviet Air Force. Buy it! You Know You Want To! 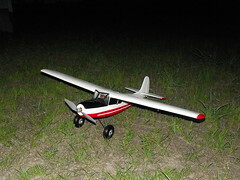 I was on the look-out for a nice bush plane that could handle less than ideal runways. The Piper PA-18 is arguably the most popular bush plane in the world but I wanted something different. 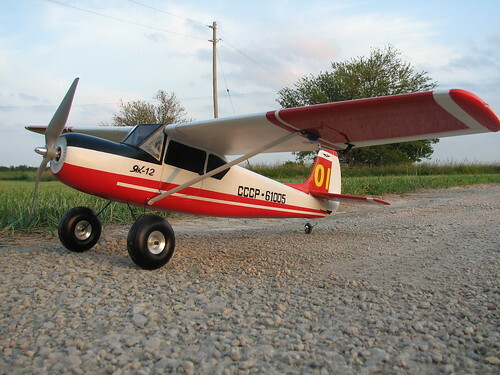 I looked through the many low cost ARFs that are out there and, when I saw the Yak-12, I knew I had found my next project. 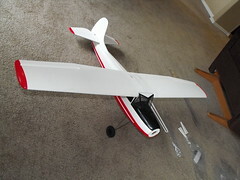 Shipping from their Hong Kong based warehouse can be a bit high but, when I factored in the cost of the plane at only $70, it only came out to $100 shipped. Many ARFs cost much more than that. I placed my order along with an order for some lights and a set of tundra tires at HobbyKing (also based in Hong Kong) at the same time and then sat back and waited for the long delays in shipping everyone seems to experience when buying from China. Four days later I received a real surprise in the form of a plain brown box, a full two weeks before the lights and tires showed up from HobbyKing. 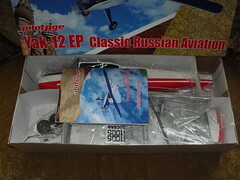 I had read other reviews online for the Red Square IL-2 and was looking forward to seeing how well the Yak was packaged. While it did not have the funky green wrapping paper that those with the IL-2 have reported (I have to admit, I was kind of looking forward to “unwrapping” it), it survived it’s long trip to Kansas without a scratch. The Yak arrived double boxed to help protect it. The planes box is very well decorated with great graphics as well as stats on the plane in both English and Russian. 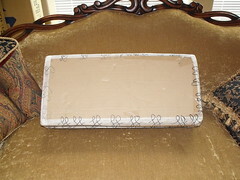 Opening the box found all the components securely taped in bags in separate compartments. 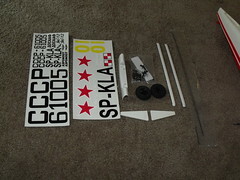 All the small parts are also taped down so nothing can come loose during shipping and damage the airframe. There are two sets of instructions, one for English and the other in Russian. There are some rather glaring errors early on in the instructions. In the introduction, it refers to the model as being a “reproduction of the world renowned competition level aerobatic aircraft” and that it’s capable of “thrills of aerobatic and 3D flight”. Obviously this has been taken from one of their other kits. I also noticed that the instructions have not been updated in a couple small areas. First is the obvious fact that the colors have changed for the plane. This is really too bad because I rather like the blue on blue colors of the one pictured on the box art. The other point I noted is that, when installing the landing gear, you are told to insert a “landing gear lock shim” into place. I never found this piece and can only guess it has been omitted from the design. On mine the landing gear are a very tight fit into the bottom of the fuse anyway and there is really no need for anything more than a friction fit. With the exception of these two small issues, the English instructions are very clear, concise, and easy to follow with good quality black and white photos. They do not require the typical “deciphering” of poorly translated English found in many modern ARFs. 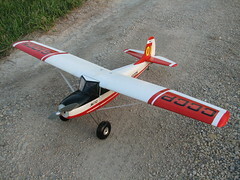 The airframe is a unique mix of wood and foam. 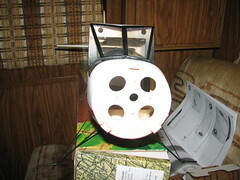 Unlike many foam ARFs, which are just carved or molded out of solid blocks of foam with interiors carved out to accept radio gear, Red Square Models chose to use a hollow depron style construction with some internal wood structure, mainly to mount the radio gear, battery, and motor. Battery access is through a cabin door on the left side, a nice change from the usual “battery hatches” found on other planes. This maintains a nice, clean appearance, but it can also be a little tricky installing the battery. The wing is constructed in much the same way as the fuselage with wood ribs and foam sheeting. String is already in place to help pull the needed servo extensions through the wing. 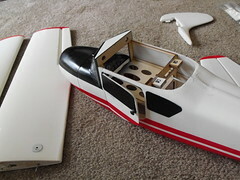 The wing is glued together after you install the aileron servos and a plastic piece is attached to the leading edge of the wing joint for mounting it to the fuselage. The instructions call for this cap to be permanently attached in place but I knew I wanted to install lights and would need access when they arrived so I choose to not glue it. I performed its first flight this way and had no problem. I may decide to tape it on at a later date but for now it gives good access to the lights if needed. The fuse has a length of white tape covering the centerline where the two halves have been joined together. Unfortunately, there is no such tape included to cover the wing joint, which would have been a plus. It should be noted that there is no spar between the wing halves. This seemed like a serious oversight to me at first, but I have now flown it through some fairly rigorous maneuvers and see no signs of the wings wanting to fail. 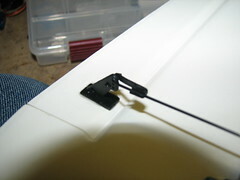 Be sure to use a fairly liberal amount of epoxy when attaching the wings together to insure a strong bond. Don’t go overboard, but at the same time, this is not a spot to consider weight savings. Attaching the tail is straight forward and simple. All control pushrod tubes are preinstalled and ready to go. If you plan to install FAA style lights like I did, you should avoid attaching the tail feathers until you have the lights ready to install. Otherwise, drilling a hole through the vertical and pulling the strobe light back up through it is nearly impossible. I found this out the hard way, and eventually ended up carving a channel in the side of the vertical down though the top of the fuselage for the light wires. This was something of a happy mistake for me however, as it gave me the reason to add some Trimcoat to the tail which really added to the overall appearance in my opinion. As I mentioned before, the landing gear wire is pressed into a slot in the bottom of the fuselage. 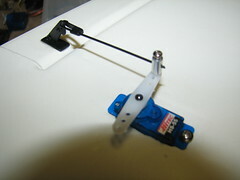 Originally, the kit included a shim that was to be glued in after the gear wire to secure it. However, my plane did not include, nor did it need any such shim. One of the more interesting features of the design of the Yak-12 is that the gear have an additional strut connecting from the axle to the side of the fuselage at the wing strut attachment point. A single #2 screw is threaded through to the wing strut and this gear strut into the fuselage. Since the struts are not strong enough to be functional to the structure of the wing, and I wanted to make the wing easier to remove, I opted to attach small magnets to the struts, fuselage, and wings to attach the struts instead. I have not flown it yet with the magnets, so I don’t know if they will stay on. The plane looks good without them, so I’m not too worried about losing them. The #2 screws now only attaches the secondary gear strut to the fuselage. 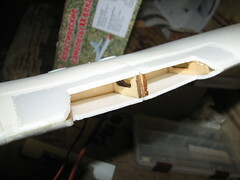 Additionally, two small wedges of foam are included to glue over this secondary gear strut to provide the illusion of a flat plate style landing gear. After mocking the model up, I decided to omit these foam pieces as I thought the bare wire gives the model a little more of the utilitarian bush-plane look that I wanted. The tall grass would likely rip them off anyway. Of note about this landing gear strut is that, since it attaches to the fuselage at three locations (the slot in the bottom and screws on each side), the gear are quite stiff and ridged. Repeated rough or hard landings may result in structural damage to the airframe since the gear don’t absorb that much of a shock. Time will tell if this is a problem or not. The big ballon tires soak up a lot on mine so I am not too worried. The included wheels and tires are nice looking and quite scale to the aircraft. They are foam rubber construction and are very light weight. However, since I was going for the bush-plane look and I wanted the plane to handle less-than-ideal runways, I opted to go with a larger set of tires ordered from HobbyKing. These tires are 3” diameter, which equates to about a 30” diameter tire in scale, which is in the range of real tundra tires. They weigh quite a bit more than the stock tires, but I had to try them anyway for the look. With these tires, the Yak handled takeoff from an unprepared lawn with relative ease. Grass was cut to about 3” (the tires were almost completely covered), yet the plane easily pulled through it with little tendency to nose-over. On my first flights, I was using the stock tail skid, which worked okay, but prevented any sort of taxiing. 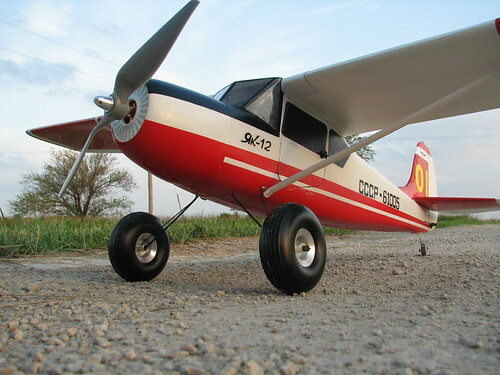 I have since installed a small castering tail wheel that nicely compliments the larger main wheels and should provide good ground authority. The weather has not been cooperating so I have not tested ground handling with the new tail wheel, other than a few quick taxies in the garage. 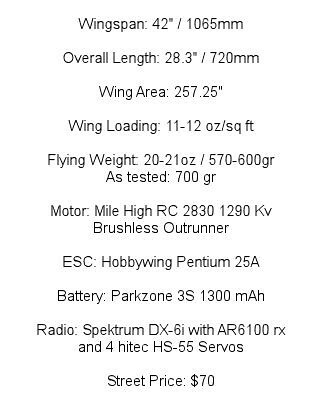 Flight performance was impressive on the MileHighRC 2830 1290Kv motor I chose to use. Cruise is at about half throttle, and she’ll actually climb straight up from your hands. I haven’t tested this of course, since the controls don’t allow for 3D maneuvers. Takeoff is fairly easy for a high power tail dragger. It does require a little rudder to counter the torque, as is to be expected. On my first flight, I had forgotten to check the trim settings and the plane was wildly out of trim to the right. Right after takeoff, the plane banked hard to the right and made a nice tight circle around the “airfield” before I managed to level it out and work on stabilizing the trims. I took it up a ways and had my brother dial in some aileron trim because it tried to snap if I let off the control to dial in trim myself. 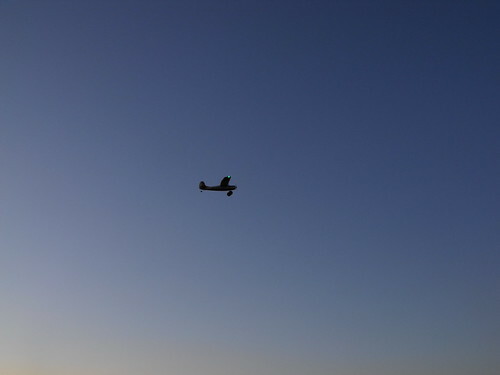 After that, I brought the plane back for some nice low flybys and was very impressed with its stability and authority in the air. The aircraft tracks straight and goes where you point it. Stall tendencies are quite predictable, with only a little wing drop, and only a little power is needed to arrest the stall. It does have some torque-rolling tendencies at full power that might be alleviated by either a smaller motor or the addition of some more thrust offset. One oddity I noticed while flying is that the plane really wants good coordinated control input. It is unusual to see park flyers that need a coordinated rudder input when banking, but this one does. If you don’t add some rudder, there is a noticeable tail sag during banks. This was a pleasant surprise for me as I’ve always needed more practice with coordinating turns. Overall, I am very impressed with how this bird flies. 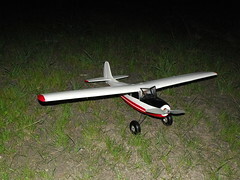 Flight times on my E-Flite 1300 mAh 3S battery were in excess of 12 minutes with some throttle management. Most of the flight was at about half throttle. My overall experience with this plane has been great. 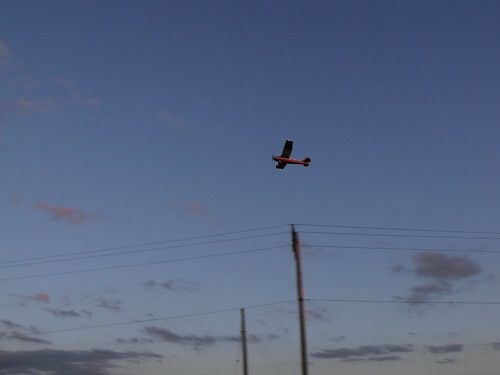 For those out there interested in more unusual aircraft than what most other manufacturers are offering, take a look at Pilotage RC. If you’re in the market for a good advanced high-wing trainer, a good bush plane, or simply want something that will stand out at the flightline, the Yak-12 EP will certainly fit the bill. Bill Dickey at Pilotage-RC was wonderful to deal with and went out of his way to assure I had a pleasant experience. 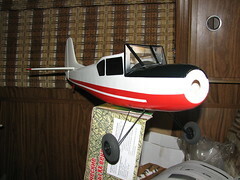 He even contacted me three weeks after I ordered the plane to see how I was doing with it. Mike Maloney at MileHighRC was also a pleasure to deal with and was instrumental in helping me choose a powerplant for this plane. Last edited by n001pa; 06-12-2010 at 08:24 AM. 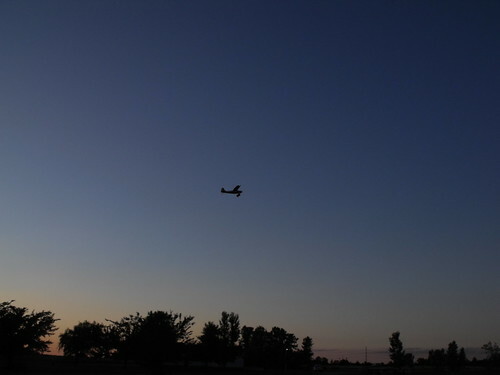 Finally got some clear weather to fly againn tonight. First flight with the tail wheel, struts, and all the extra colors. As I was affraid,the castering tail wheel made ground handling nearly impossible. I am now goint to redo it with a steerable wheel. Ishould have done that in the first place but I was working with what I had at hand. I also lost one of the struts. I guess the magnets weren't strong enough. I really didn't think they would last. I'll make up some more an come up with a better way of attaching them. 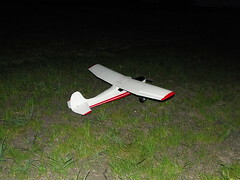 The interesting thing is that, on my first flight of the night, I had a serious problem triming it again. 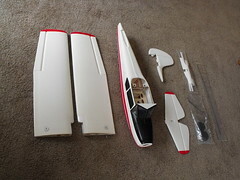 I had full aileron and about half rudder trim. When I brought it down low was when I noticed that I had lost the strut. My brother pointed out that I had it trimmed to direction that was mising the strut and that maybe it was drag. I couldn't believe that the strut could possibly be causing that much drag but I landed it anyway to check it out and make sure I didn't have a stuck aileron or something. Everything looked okay so I pulled the strut off and gave it another toss. Flew great then! I guess the strut was the cause. I also found one more thing that needs addressed during construction. 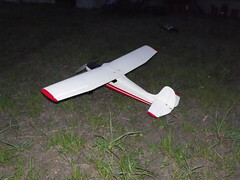 While I thought the landing gear were plenty tight enough and didn't need the shim that was missing in my kit, my last landing of the night proved me wrong. I was landing in tall grass and came in a little too hot. The plane came to a pretty violent stop. The landing gear popped right out and will not stay anymore. Some epoxy in the gear slot will fix it right up. Unfortunately, I also broke the motor shaft so I am going to have to wate for a replacement shaft from Mile High. Got a few photos and a very short video of a hand launch. They are not great because it was getting pretty late but the lights look perfect. I think I will now be adding flaps to help it slow down during landings. Mine is a little too heavy and I think the flaps will help it. I also can't stress enough how much it needs coorordinated rudder input during turns. I think this is my favorite thing about this plane. It will make me a better pilot. Still happy though because it looks great in the air. Cool plane! Looks great in the air. I thank you for posting because I may never have considered this one, otherwise. I wish I was as eloquent as the above poster, but not everyone can be so poetic. Michael Kors Outlet Store will never get any of my business. Why not.. hold my tea! How do you order this model? I can't seem to find the website. It really looks like a winner and I may order one. Here's a link to where the model may be purchased, but since they are in Europe, I'm not sure how far they would ship. I Red Sq Models is no more ... they were heavy suppliers to PILOTAGE ... who is now bankrupt over here.